Kurdistan was the first nest and the birthplace of humanity and civilization, where the earliest people departed to from the mountains and wildlife. The village (Charmo) in Chamchamal district– Kurdistan Region is the tangible and live evidence of this fact, and it is considered as the first Agricultural village in the world and the most ancient agricultural habitation in new Stone Age, during (1948-1955) the professor (Brid Wood) from the east institute of SAM languages and Arts that belongs to Chicago University – USA, who did the prospecting in the village and he found around (25-30) mad houses and stone home basis. With the remnants of the bones of animals, goats, pig, deer, and the dog, this was domesticated by the villagers. And also it has been found grains of wheat and barley in those houses and especially in the graves. The history of the village returns to about 10,000 years BC, and the information confirming that the people of the area were of Kurdish nationalism and working on agriculture and the history of agricultural revolution started from this village and transported to other places. And that this region was the owners of wheat, barley, chickpeas and lentils, and domestic animals such as goats, deer and pig and dog before other nationalities. But after the second half of the previous century many destruction campaigns has made in the area that led to the demolition of (4,500) villages of the total of (5,131) villages, and displaced villagers to compulsory compounds (Residential areas) and confiscation of their lands, burning of forests and orchards and switch careers peasants from Farmers to a service workers. And those reasons and many others led to the collapse of the agricultural situation and the decline of self-sufficiency to importing region. To renovate previous abilities and characteristics it had to put the idea of the strategic plan in 2006 to during the fifth cabin of the Region Government and it has been implementing the five-year plan in 2009 with participation of other sectors such as water resources, trade and food industries. But because of a lack of budget which provided only (9.2%) of the required budget, so it could not implement all goals but we got some joyful results of some products such as wheat and potatoes that can cover more than 100% of region needs and for some other products can cover 54% and some other was below of our requests that does not reach 40%, but conclusion average plan decreased the total local products around 15% and covered 30%-45% local consumption. And from this point of view the ministry of agriculture and water resources of Kurdistan Region suggested the future plan for other five years (2015-2019) but for the reason of financial crisis and ISIS was and the cutoff of regions’ share of the Iraqi budget (17%) by GOI led to the non-implementation of the plan. Actually the financial crisis affected the agricultural sector especially in the farmers’ subsidy from one hand. From the other hand the ministry of agriculture and water resources took this opportunity to take advantage because most people lost their source of income and this gap offset by agricultural activities some people went to agriculture and villages for work and the Agricultural activity and agricultural employment increased from 16% to 20% and also led to increase the products. The vision of the Ministry of Agriculture and Water Resources (MoAWR) is the following: “Obtaining food and water security in the KRI.” The mission of the MoAWR for the next phase is food and water sufficiency for the KRI, which comprises the main goal of the roadmap. All the projects and objectives are designed to serve this goal according to the available human and financial resources for each objective. The duration is five years, starting from 2015 and ending in 2019. It is projected that with a 3% annual population growth rate, the population of the KRI will increase from 5,356,531 to 6,209,688 by 2019. The projected food and water needs are based on the estimated population of the KRI in 2019 and take into consideration the calories a human body needs on a daily basis, which is 2,800 to 3,200 calories. 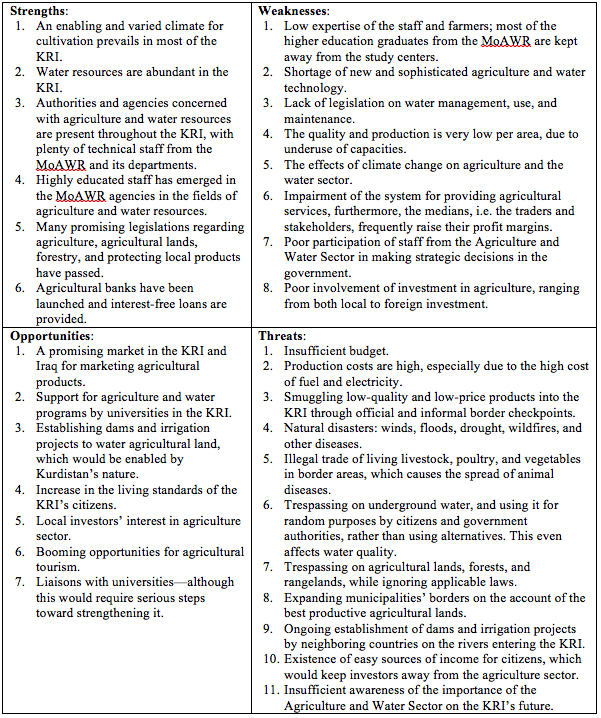 The food and water reserves in 2014 serve as the baseline for these projections; in addition, we conducted analysis to the agriculture and water reality in KRI, and the risks that these two sectors might face. The roadmap includes eight objectives. Each includes several strategic goals, and each goal consists of several plans, projects, programs, and mechanisms. The policy for the next phase of the Agriculture and Water Sector has been outlined in the roadmap, due to their key role in achieving the goals and missions of the MoAWR’ agencies. These goals include proper rules and regulations, accompanied by inspiration and guidance from the MoAWR. The institutional functioning, the organizational structure and courses of action start from the top of the pyramid, starting with the MoAWR and devolving down toward the bottom agencies. In the base line, it starts with the farmers and continues to the production units in the fields and villages. Farms shall become scientific workshops and on-job training sites for the farmers. The proposed budget for the roadmap is 3,030,200,000,000 dinars. The duration of the plan is five years. The indicators are the following: increasing local production by 20%, increasing the water storage capacity by 3.9%, increasing the irrigated lands by 4.1%, increasing green spaces by 0.5%, decreasing diseases and infectious diseases by 80% and 30% respectively, applying modern marketing systems, decreasing the trespassing of agricultural lands by 80%, and increasing agricultural investment by 3%. To insure the success of the plan, teams for the follow-up and evaluation of staff performance and projects shall be formed on the KRI’s level as well as within each province. From(5,356,531) in 2015 to (6,209,688) in 2019. Increase rate 3%. A. Per Capita requirements of food and water: for food self-sufficiency, the basic needs from food for obtaining the needed calories by a normal person under international standards are shown in the following table, along with the needs of the total residents for one year. B. 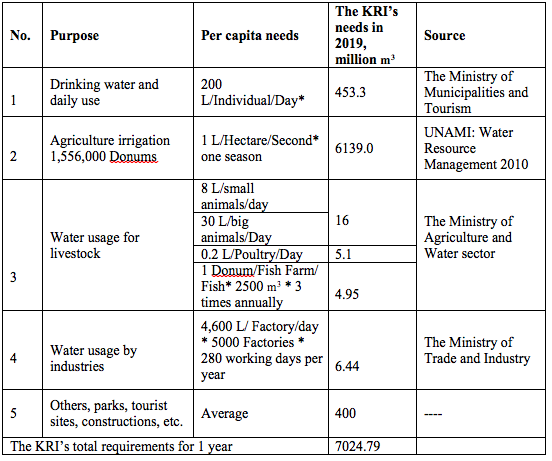 Water demands of individuals and sectors: The following table shows thedemand for water from individuals and sectors along with the amount of water needed for livestock. As the climate differs in the Kurdistan region from one place to another, the MoAWR is currently working on a new structure for determining the right location for the right crop according to the type of land, precipitation, and temperature. Only by considering these variables, we can be on the right path to raise the current level of strategic products. Currently, all of these depend on the farmer’s judgment and expertise, as well as the limited experiments of agricultural study centers. Eventually, the level of production is not up to the ambitions of the MoAWR. It is delightful that wheat—which is a basic and strategic foodstuff for residents—can meet the KRI’s demand. This is due to the support from the MoAWR, which resulted in raising the production to 844,582 tons in 2014, more than one million tons in 2015 and 1,686,000 tons in 2016. The support consisted of establishing four plants for wheat seed cleaning, which can provide 15,000-20,000 tons of cleaned and processed wheat seed to the farmers with a subsided price. Furthermore, providing farmers with high quantities and qualities of irrigation sprinklers have played a key role especially in Erbil province. A sprinkler is used to irrigate 24,000 Donum of cultivated land with wheat. 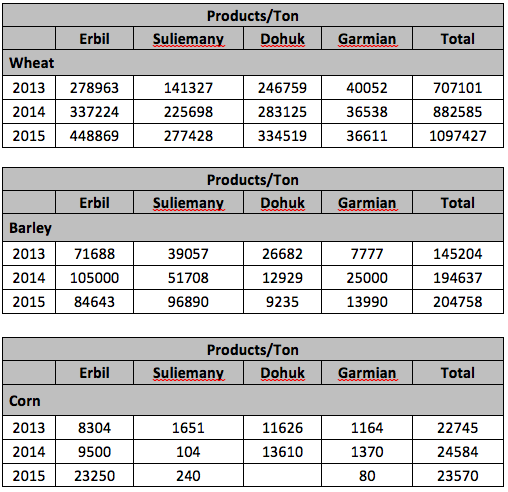 Purchasing the wheat product by the public silos was another factor in raising the production. This experience can be introduced to other crops, thus supporting the production needs rather than planting needs. Corn production also witnessed the right steps; in 2009 the annual production was only 500 tons, but currently the annual production has hit 23,578 tons. These increases can be attributed to the MoAWR support in providing seeds to the farmers. The main problem that faces the farmers is marketing the corn. The MoAWR must find a solution to this, such as purchasing the farmers’ produce and distributing them on meat animal resources’ projects. As for barley, lentils, and sunflower seeds, which haven’t received sufficient support, the production hasn’t achieved its goal. For the next phase, these crops should be given the same support as wheat in order to cover the KRI’s demands. Potato production has achieved self-sufficiency, similar to wheat, due to the right amount of support from the MoAWR. Providing the best true potato seeds accompanied by providing ongoing instructions to the farmers and protecting the product during the marketing phase are considered to be the other main factors that have helped in achieving self-sufficiency. 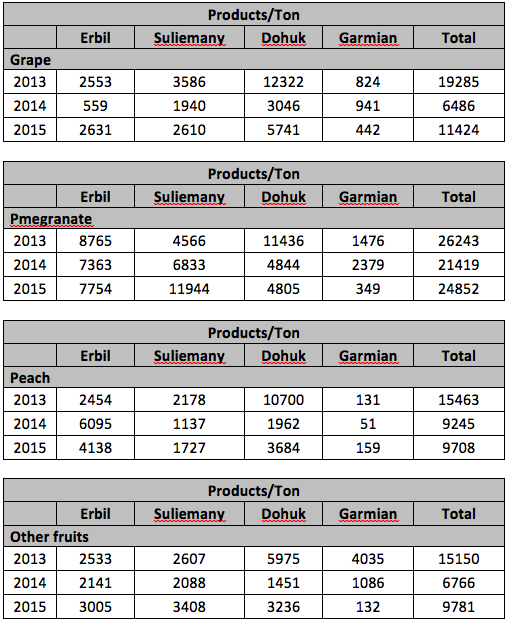 Production is 123,334 tons in 2014 and 150,383 in 2015 while the KRI’s demand for this product is 77,000 tons. Other vegetables can cover 62% of local demand. The basic requirements for self-sufficiency from vegetables do exist in the KRI, provided that each strategic product (e.g. tomato, onion, and cucumber) is raised under a separate project and a special committee and department is established for each of these products. The fruit production is low; it can provide 32% of local demand. Each product ripens at a specific time and exceeds the market’s demands. Many times the farmers lose rather than benefit. Therefore, focusing on the four strategic products (pomegranate, grape, apple, and peach) via supporting the farmers and finding markets for the products remains a priority for the MoAWR during the next phase. Just like potato and wheat, fruits require their own project as well. Developing the cultivation of olive is also important for producing vegetable oil. This was included in the previous plan, which supported the farmers in the development of olive gardens of 5-10 Donums per each farmer, reaching 5,500 Donums in total. The private sector also developed 15,000 Donums. This makes a grand total of 20,500 Donums. This field is still very small and scientific studies should be carried out to the next phase in order to find actions for attracting investors, which could be fulfilled via allocating lands for this product and providing facilitation for the investors. In parallel to this program, the MoAWR should help establishing olive oil mill plants through supporting the private sector. 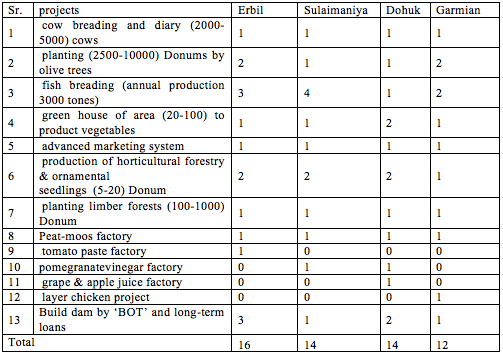 Additional to these facts in 2015 MoAWR signed cooperation agreement with Italian country to develop olive sector in Kurdistan region on the cooperation budget which granted from Italy to MoAWR and the project includes technical assistance, training, establishing association for farmers in olive sector and installing mill for them. 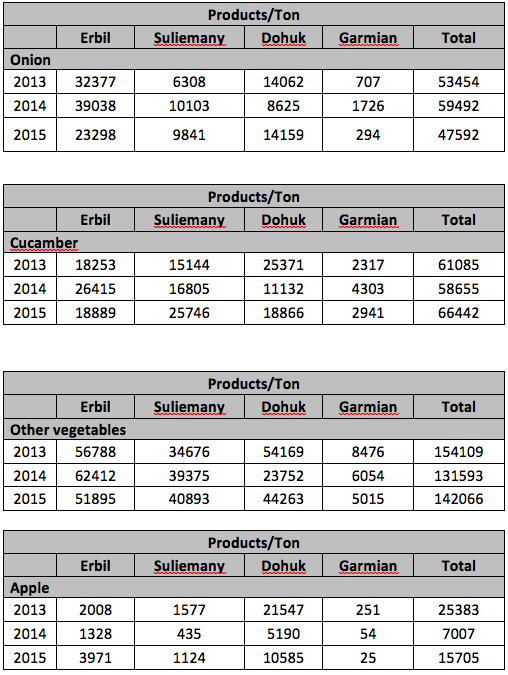 Vegetable and fruit production as a whole have declined, particularly in 2014, when compared to previous years. This is due to the decrease in temperature that spread through the region between 31/3/2014 and 1/4/2014. Meat animal production includes poultry, livestock/cattle, and fish. 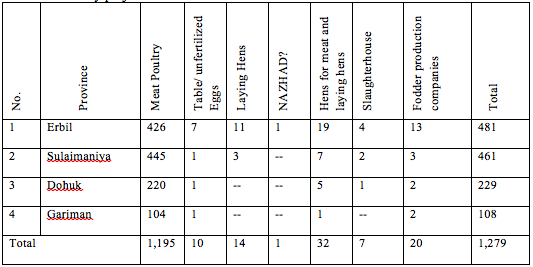 Poultry have a solid infrastructure, for both meat and egg production; however, due to strong competition from imports, the local products cannot prevail. Furthermore, the support provided by the MoAWR was not sufficient, especially in regards to providing fodder, medicine, and vaccines, which eventually affected production. The annual production of chicken meat was only 69,568 tons in 2014 but in 2015 was 81512 tons, which covers 63% of local demand. The production of eggs was 723 Million Eggs in 2014 and 734 Million in 2015, which covers 95% of local demands. However, we can achieve self-sufficiency for chicken meat and eggs with the current infrastructure if the imports are controlled, with sufficient support directed at production rather than needs, and if the production is directed through supporting the marketing process and protecting domestic products against imported products. The number of cattle, sheep, goats, cows and buffalo has reached 4,596,944. 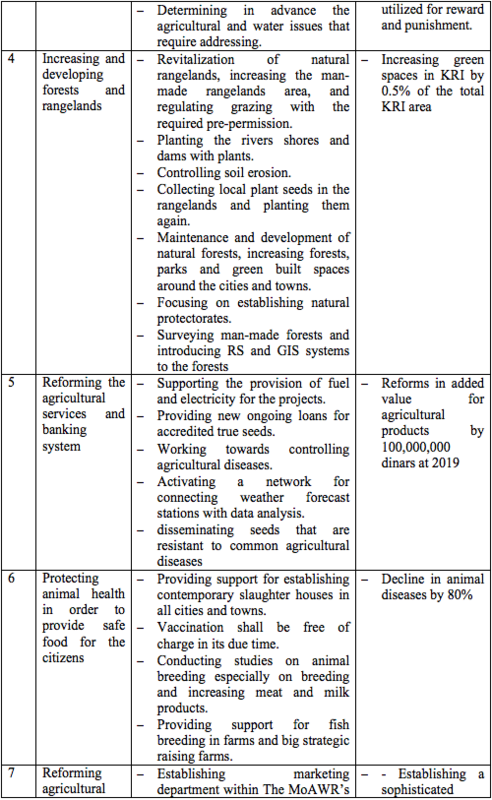 This number is fluctuating due to several issues that haven’t been tackled, such as lack of interest in animal husbandry by farmers and the appointment of farmers as civil servants, which has led to the marginalization of the agriculture sector, especially animal husbandry, by villagers and farmers. Furthermore, drought seasons have had a negative impact on water resources; both drinking water for animals and rangelands were affected. Moreover, the cattle of Arab shepherds from the center and south of Iraq have had a negative impact on rangelands in the KRI, which have not been regulated yet. This phenomenon stopped in 2014 due to the war and political situation in Iraq and the KRI. According to the Law on Forests, Law No. 10 of 2012, the MoAWR should regulate this, and the regulation is legally binding. On the other hand, the borders are open for importing milk, yoghurt, cheese, and other dairy to KRI. Due to all these factors, the self-sufficiency of red meat 85% and Milk 57% in 2014. It is necessary to support local and foreign investors to invest in dairy and meat. Parallel to this and in order to maintain local animal husbandry, there should be a great increase in support that affects the production level. 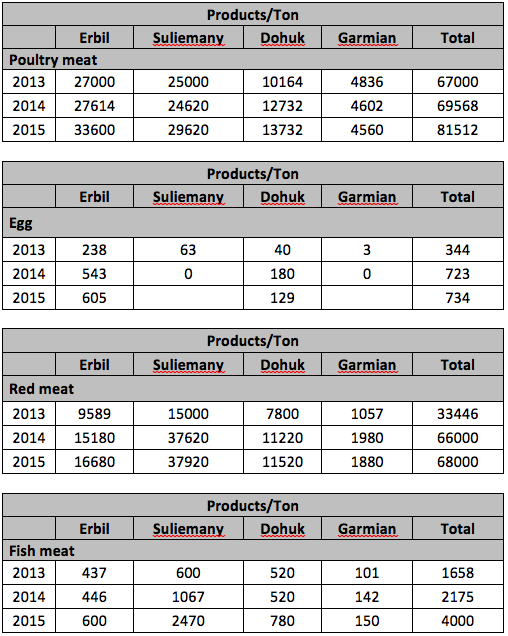 Concerning fish meat, there are 397 projects in Kurdistan that produce 4000 tons of fish meat annually, which covers 22% of self-sufficiency. In 2012-2013, with the MoAWR support to the fish farms, exemplary projects for farmers were launched. The results are promising. The Kurdistan region is very suitable for beekeeping. In the International Beekeeping Fair, Kurdistan won the first place award. Beekeepers need support regarding beehive boxes, medicines, and banning honey imports. The current annual production is 800.4 tons; with 227,000 hive boxes, it covers 62% of local demand. There are three labs for Orchards and five Veterinaries. Lab of the Erbil Directorate of Studies. This lab performs the following tests: soil and chemicals tests, manure composition, water testing, orchard trees’ inspection for nutrition, a limited diagnosis of bacterial and fungi/mold diseases, and inspection of wheat and barley for growth rate, cleanliness, and moisture rate. Lab of the Sulaimaniya Directorate of Studies. This lab performs the following tests: soil, water, and manure tests. Lab of the Dohuk Directorate of Studies. This lab performs seed tests. The lab itself is functional but the soil lab is not. Lab of the Garmian Directorate of Studies. This lab performs the following tests: soil, manure, and orchard tree tests. Orchard labs need experienced and educated staff. The MoAWR has plans to establish a central lab in Erbil that could work as a resource for the other labs. Central Veterinary Diagnostic Lab in the KRI. This lab performs the following tests: diagnosing livestock, fish, dogs, bacterial and viral diseases, determining the types and percentages of toxins in fodder, foodstuff, and physical and microbiological tests according to Iraqi standards for red meat, white meat, and fish. The lab also performs tests for processed foods and quick tests for poultry and cattle. Furthermore, it performs tests on bacteria, culturing and isolating bacteria and molds. This lab also performs tests for detecting parasites using microscopes and anatomical tests. In 2013, the MoAWR signed a contract with the Irish Food and Veterinary Office to raise the skills and capacity of Veterinary Diagnostic Lab s and ISO-17025 accreditation for test results. The MoAWR continues to make the labs reach global standards. Erbil Directorate of Veterinary Diagnostic Lab s. This lab performs fast tests for poultry and livestock using serum samples, ELISA tests for poultry and livestock diseases, physical and bacteriological tests, isolation and culturing of fungus, testing resistance and ability, and testing for the diagnosis of Babesia and Theileria parasites in sheep, goats, and cattle. Sulaimaniya Directorate of Veterinary Diagnostic Lab. This lab performs the following operations and tests: physical, microbiological, chemical, ELISA and PCR tests for poultry, livestock, and fish, serotype isolation of FMDV, PPRV, and dogs’ diseases, diagnosing the types and percentages of toxins in fodder, foodstuff tests by taking samples from the foodstuff imported from the Iraqi federal government and abroad, and taking samples from the KRI’s markets. Dohuk Directorate of Veterinary Diagnostic Lab. This lab performs the following tests: physical, chemical, bacteriology tests, ELISA and PCR test for poultry and livestock, foodstuff tests, and taking samples from imported foodstuff as well as from the KRI’s markets. Garmian Directorate of Veterinary Diagnostic Lab. This lab performs the following tests: ELISA and PCR tests for poultry and livestock, diagnosing the types and percentages of toxins in fodder, testing animals for antibiotics resistance and allergy to antibiotics, quick tests for poultry diseases, and many other tests for parasites and transmissible diseases. In 2013, the MoAWR signed a contract with the Irish Food and Veterinary Office to raise the skills and capacity of Veterinary Diagnostic Lab s and ISO-17025 accreditation for test results. The MoAWR continues to make the labs reach global standards. Orchard Services: the MoAWR supports strategic products, especially in regards to providing accredited seeds, irrigation machinery, manure, and pesticides with focus on wheat pests, rodents, and tree and bee diseases. Furthermore, it supports the transportation of vegetables and fruits to wholesale markets. This service was provided until 2012 but the service was halted in 2013 and 2014 due to lack of funds. In addition, some other services were provided, such as Agricultural Calendar, which includes the Support Schedule, and the Productive Farmer, and strategic projects definitions. Meat Animal Production Services: there has been an ongoing support for providing fodder for livestock, poultry, and fish, but due to a decrease in funds, only 10-20% of farmers were provided with fodder. Veterinary services and vaccination were also provided totally free of charge. Work is undergoing to upgrade the labs and foodstuff tests until they follow international standards. Agricultural Studies and Guidance: since no special budget has been allocated within the KRG public budget for this field, it is funded by the farmers’ Fund. Different tests are performed in study centers on grains, vegetables, fruits, and local chickens successfully. However, the tests should be upgraded and changed from theoretical to practical, especially studies conducted in universities, which requires support from universities. The MoAWR is currently coordinating with the Ministry of Higher Education and Scientific Research to bring agriculture experts from the universities to the study centers of the MoAWR in order to conduct research that directly affects increasing production and improves quality. Dedicating to providing agricultural guidance, there are 43 Guidance/Instruction Centers in the KRI. Guidance centers need restructuring and reorganization; furthermore, they need to be separate and independent administratively and financially in order to serve the farmers. The agricultural guidance must be connected to the study centers. This shall be considered during the restructuring process. The technical staff from the MoAWR with authorities in provinces and sub-districts shall oversee the work of farmers from the fields, and turn the farmers’ farms into learning centers rather than using Instructions Centers. The structure of the Study Centers also needs reorganization. Furthermore, for the next phase the MoAWR staff should participate in university studies as a technical party in the studies conducted in the study centers. Furthermore, there should be an administrative supervisor from the MoAWR along with the scientific supervisor from the university. Agricultural Machinery: the number of agricultural machineries in the KRI is 17098 tractors, 1482 harvesters, and 6,250 sprinklers and drip irrigation systems. The MoAWR shall continue providing support by maintaining and distributing the equipment in order to increase production, and lessen the wasted water in the KRI. 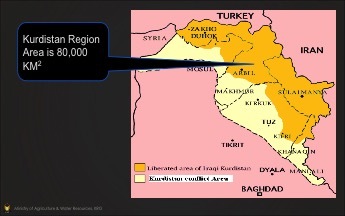 The Kurdistan region is rich with water resources; it has five big rivers with a water discharge of 29.77 m3 billion annually, 17.74 m3 billion of which emerges from within the KRI’s borders while 12.03 m3 billion comes from neighboring countries, in addition to underground water which is estimated at more than 5 billion m3. The process of managing and maintaining water resources is not efficient. This is due to several factors: low water storage capacity, low number of big and strategic irrigation projects, trespassing on the rivers’ discharge and shores, the misuse of water by the irrigation projects, and misuse of underground water and welling with and without permission. As for the dams, 12 dams have been built so far. Many other dams are under construction, three of which are medium sized while 22 are small dams. 91 ponds were built, 29 ponds are under construction, and 105 ponds are currently in the designing phase and have been announced for tendering. The number of ponds will reach 320 ponds by the end of 2019. The KRI still needs more large dams. Currently there are seven large dams under negotiation with foreign companies, which will be implemented via long-term loans and BOT. As for irrigation projects, around 21.3% within the KRI depends on irrigation water and 78.7% depends on rainwater. In addition, managing and maintaining water is not regulated within a legal framework. Moreover, the water treatment processes have not been introduced to the sewer system. In order to recycle and reuse wastewater, a solution must be found in cooperation with the Ministry of Municipalities and Tourism. Insufficient budgets allocated for the Agriculture and Water Sector by the KRG, which needs 10% within the KRI’s budget for the reconstruction phase. The allocated budget hasn’t exceeded 4% of the annual budget in any given year. The KRG does not consider agriculture and water to be priorities; rather, it focuses on oil and gas and ignores agriculture and water. The lack of legislation regulating water management and maintenance is one of the main reasons behind the misuse of water, water contamination, and trespassing on water resources, irrigation projects, and river shores. Lack of the robust cooperation with universities that otherwise exists in developed countries. Leaving Iraqi borders wide open for illegitimate and illegal imports has a negative impact on the KRI’s agricultural products. Digging deep wells for underground water extraction in large numbers, should it be with and or without proper permissions, has dropped the level of underground water by more than 30 meters. The taking over of agricultural lands by the municipalities. So far, 1,651,199 Donums of the best agricultural lands have been repossessed, inserted into municipalities’ borders, razed, and replaced with concrete blocks and buildings. The continuation of this situation will eventually lead to the total destruction of agriculture in the KRI, and it puts a massive burden on the KRG when it comes to the provision of services for these vast areas—services such as water, electricity, roads, schools, police stations, and so on. Lack of the solid cooperation with universities that otherwise exists in developed countries. Unsatisfactory implementation of rules and regulations, especially in regards to controlling illegitimate imports in order to protect local production. Production requirements are imported, such as fodder, manure/fertilizers, seeds, medicines, vaccines, and so on. Lack of a scientific system for marketing farmers’ products and application of old methods. Rangelands are on the verge of annihilation due to unplanned grazing and drought. Wildlife and different living things are under the threat of extinction. The needed power for protecting these is scattered between several different ministries and authorities. Due to economic growth, increase in investment projects, and launch of new roads and other service projects, forests have come under the threat of shrinking. Natural disasters such as rising temperatures, floods, spread of diseases, and wildfires have a continuously negative effect on forests. Second Objective: Ensuring a water storage capacity of 10,500 billion m3 and irrigating 1,561,760 Donums of agricultural land. Goal No. 1: Increasing storage capacity to 10.5 billion m3. Goal No. 2: Irrigated cultivated land reaching 1,561,760 Donums. Third Objective: Upgrading the scientific level and vocational skills of employees, strengthening study centers, conducting studies on the needs and requirements that will achieve sufficient quality and quantity, solving problems that face conducting studies, and ensuring the role of Agricultural Supervisors in raising farmers’ awareness. Goal No. 1: Increasing the area of forests. Goal No. 2: Connecting weather forecast networks to production and predicting agricultural diseases. Processing data on weather, rain, winds, and temperature to obtain information and provide access to farmers with this information online. Goal No. 3: Selecting the proper seeds and plants for the KRI’s soil and weather, including working on the production map and directing support toward investing the right products in the right soil. Goal No. 4: Connecting support to productive farmers with productive economic criteria and providing encouragement and support to farmers in order to establish associations and cooperation among themselves as well as with small- and medium-sized farm owners, with the purpose of unifying all capacities. Goal No. 5: Expanding agricultural banking services to include all production and marketing processes, raising the limit of loans to one billion dinars, continuing to keep banks open for farmers throughout the year, and easing the terms and conditions of lending to the farmers. Goal No. 5: Supporting the establishment of associations for producers of red meat, chicken meat, fish and dairy products. Eighth Objective: Sustainable management of agricultural land in order to provide an enabling environment for agricultural production, settlement of the farmers on their lands, and attracting capital for the farms. Ministry in the current stage supports buying wheat from the farmers to urge them for the sustainable production which is an essential crop for human use in Kurdistan. In same manner the ministry is supporting the prices of barley, which is used as animal fodder. In the program for the coming years, the ministry supports the prices of buying corn production from the farmers. At the current stage the policy consists of supporting farmers by providing them with seeds, specially (wheat- potato- corn- tomato and onion) and insecticide, vaccines and medicines for animals, fertilizer, irrigation, plowing and harvesting machinery especially for potato. Controlling infectious, trans-border diseases, assurance of food safety. Monitoring the importing and exporting the veterinary medicines in the border checkpoints. Supporting and urging Private sector to present veterinary services. Controlling and preventing the spread of common and trans-border diseases by raising the efficiency of the quarantines and providing the quarantines with the adequate requirements and raising the scientific level of the quarantines staff. Assuring vaccines when needed at the right time to vaccinate animals to prevent disease. The policy for 2015 marketing support to chicken meat will be adopted, when succeeds; this support will be adopted for other products. B-	Controlling import of live animals, animal’s production and medicines and vaccines in illegally way. A-	Since 2009 until now giving interest free loans for farmers for supporting to build an agricultural project and the ministry will continue supporting the farmers through the Agricultural bank. B-	Increasing agriculture loan ratio and generalization this lending to all stages and production requirements. C-	Establish a special fund in ministry of agriculture and water resources to support farmers. Supporting electricity and fuel prices for farmers for example supporting for electricity price by 60% of real price. 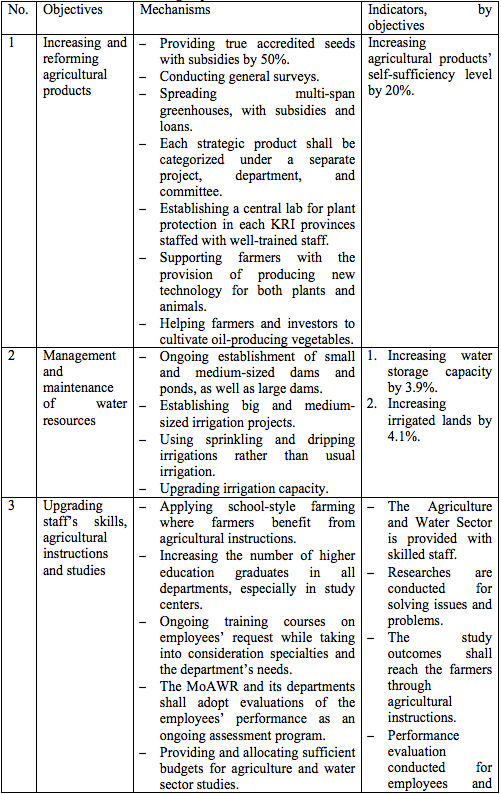 Directing agriculture support towards strategic crops. Ensure that the Marketed product is safety and pure of pesticide residue and effect of medicine and according to the standards. 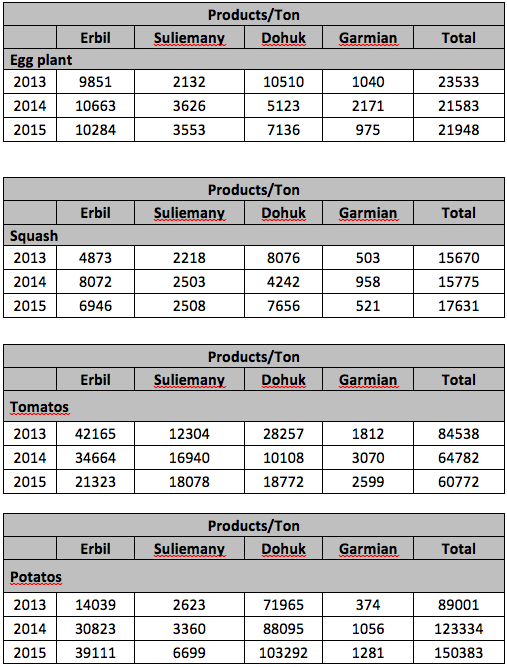 Vertical and horizontal expanding of agriculture production. Supporting should be according to production map and the region will divide to several agricultural areas for planting. Re planning for plant and animal production especially for animal wealth for establishing an integrated production system, and development of system for livestock and fish resource. Linking Agricultural Extension with agriculture research and participation of agricultural guidance in the implementation of research with researchers. Recognize the producer and distinguished farmers will be a part of decision making in the agriculture sector. Preparation to build required stores and silos to store strategic crops. Supporting consolidation of agricultural lands which is now divided to small non-economic plots due to sale and in heritage procedures, regulation of these issues by an adequate law for bring magnificent economic unit of agriculture land. Identifying forest and pasture areas on Kurdistan region’s map and collecting all agricultural lands for the benefit of the ministry. Defining agriculture land as a national resource and preventing override over agriculture lands or using the agricultural land for non-agriculture purposes. Reviewing of laws and instructions to be compatible with other policies, at the same time, decreasing routine procedures in the work. Applying electronic system for faster connection between all veterinary quarantine centers of the general directorate of animal wealth and veterinary and applying the follow-up system (Traces) to control on type, source and certificates for the imported stuff. Also applying this system between all agriculture quarantine centers. Providing laboratory equipment’s to perform fast testing in veterinary quarantine in the border checkpoints. Establishing a reliable lab in the region have the ability to survey and diagnose disease as well as the possibility of chemical and biological analysis and also to undertake research in the area of disease and food safety, feed and business evaluation. Support establishing of private factories for making vaccines. Issuing a law of water management to regulate the usage of water and protection of water resources in the region. Water has an economic value, but for agriculture sector the quantity of water needed for each crop will be free for farmers anyone who exceeds the needed amount of water will get a legal penalty. Preserving underground water and using it only for a necessary condition and controlling deep wells according to basins of underground water. Supporting projects and crops need lowest amount with highest Production. direction towards taking advantages from rain and surface water through water harvesting and supplementary irrigation. Creating pond and dams (small, medium, large) for water storage. Increasing water storage capacity by 3.9% and increasing irrigated and cultivated lands by 4.1%. Having skilled staff in the Agriculture and Water Sector. Utilizing studies to solve problems. Delivering studies’ outcomes to farmers through agricultural instructions. Performing evaluations conducted for employees and utilized for reward and punishment. Increasing green spaces in the KRI by 0.5%. Reforming the added value for agricultural products by 100 billion dinars by 2019. Reducing animal diseases by 80%. Setting a sophisticated system for agricultural products’ marketing and providing for 30% of the market demand through this system. Protecting agricultural lands and reducing trespassing by 80% by 2019. Changing or amending needed laws. In accordance to the law on investment, law no. 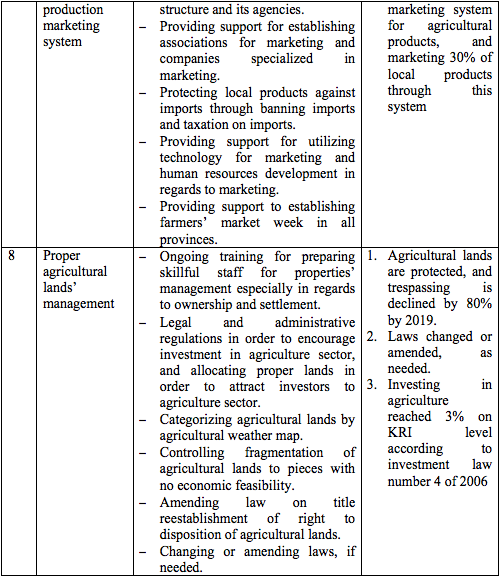 4 of 2006, the Investment in agriculture shall reach 3% on the KRI level.